Can you send me a samples of the Sage Green#10 envelope please? I want to see how it works with my letterhead. We manufacture these sage green beauties. 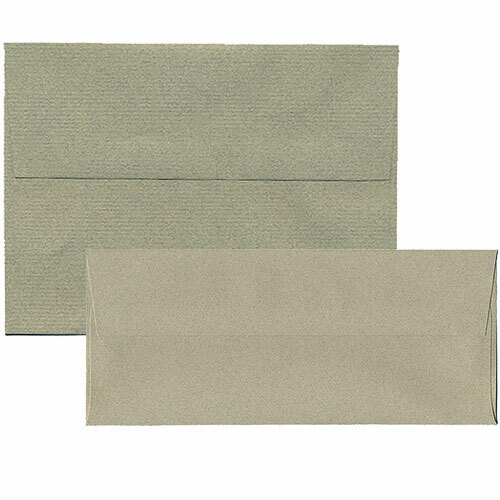 The dusty green grey color of Sage Passport Envelopes gives them an earthy tone and texture. Ideal if you’re going for a classic rustic look. Whether you want to use these envelopes for invitation purposes, letter writing, or business marketing, each will give them message of tranquility, calmness, and subtlety. The grainy and dusty look gives it a little edge while the green and grey combination gives it the professionalism and classic look you're in need of. Make your envelopes give that subtle message of peace without being too overbearing with our Sage Green Passport Envelopes! Made from 30% post consumer paper, these envelopes are great because they have an eco-friendly edge up on other envelopes. With the assortment of sizes we have to choose from (that are listed below), this way you'll find the one that fits your occasion.